A goofy bumper sticker can always make you chuckle - even when you're stuck in rush hour traffic. Being bumper to bumper isn't so bad, when you get to laugh a little bit. Now you can spread some of that same humor on all your letters and packages. 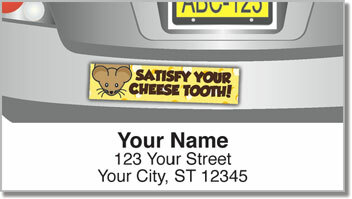 These comical return address labels feature four funny phrases that you can stick on all your outgoing mail. But what you'll really love is the convenience. A handy, self-adhesive backing on your new mailing labels makes the task of filling out envelopes extra easy! 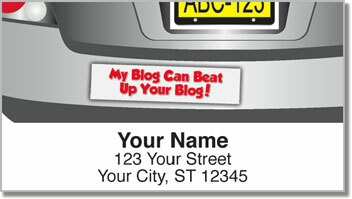 Just put them in place instead of scribbling out your name and address over and over again. 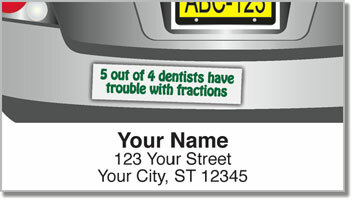 Get your own Bumper Snickers Address Labels today! CheckAdvantage also offers matching checks and checkbook covers - all with free shipping!